The plan to connect all seven of the ski areas in the central Wasatch Mountain range, near Park City, Utah, could be a boon for local skiers and businesses, creating one of the most talked about ski experiences in North America. Detractors say that it will destroy the environment and character of the area. Here is more on the latter argument from Carl Fisher of Save our Canyons. Bad ideas never really go away, they just retreat underground for a period of time and re-emerge as a “cutting-edge concept” or “game-changer.” One Wasatch is simply a reanimated version of the 30-year-old idea to link the seven resorts in the Central Wasatch (Alta, Brighton, Canyons, Deer Valley, Park City, Snowbird, and Solitude). Between the time that the first interconnect concept was launched in the 1980s and today, interconnect has attempted to become a reality in the Wasatch in a number of iterations. Some portions of it have come to fruition — Alta-Bird, Sol-Bright, and now let’s just call it Vail-isker (the impending Park City Mountain Resort and Canyons merger thanks to owners Vail and Talisker). Other more controversial proposals, like the ambitious SkiLink and a concept to connect the canyons via tunnels through the mountains, have not. 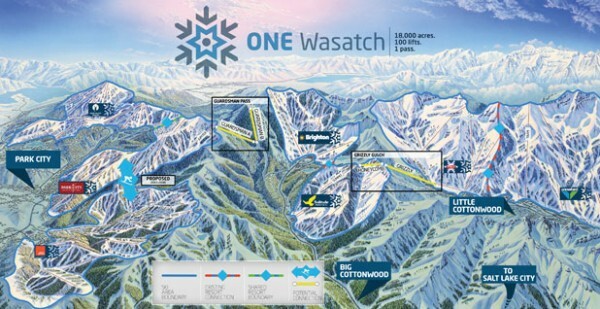 One Wasatch represents a package of all the bad ideas over the years, leaving the wild portions of the Wasatch a jumbled mess of ski lifts and runs crisscrossing an otherwise pristine landscape. Save Our Canyons has been a long-time defender of the Wasatch and opponent of ski area expansions such as One Wasatch. Why? Because in our perspective connecting these resorts comes at the expense of not only our environment but the experiences we’ve enjoyed in these canyons for decades — long before there was a “Ski Industry.” We’ve had these experiences back when the resorts resembled the scrappiness of rural areas in Europe or small community-first ski areas in the U.S. When it was more about spending a day in the mountains than staying in luxury accommodations and forking over $20 for a hamburger. The best thing about the Wasatch is that it’s still wild, even if it’s adjacent to the resorts. Much like the rest of the State of Utah and the West, a patchwork of property ownership plagues the region. To say One Wasatch can be built on private lands is patently false. Not one of the four central Wasatch ski areas (Snowbird, Alta, Brighton or Solitude) resides solely in private ownership. The other land is the Forest Service’s. That means that they are partners with the public in the operations of their ski areas. For nearly 25 years, the US Forest Service has maintained that the ski areas should not expand outside of their current boundaries. This is in part because of environmental concerns surrounding the increase in the development footprint inside our municipal watershed, but also because of our proximity to a rapidly growing urban population — one making the our forests the most heavily used (for recreation) in the entire country. When a resort expands its boundaries, not only does the public lose access to a place it traditionally enjoyed, but it also loses the values for why they went there in the first place. The one thing we agree on with the One Wasatch proponents is that the Wasatch Mountains are a compact, grand, and iconic mountain range. We are lucky to enjoy access to awe-inspiring alpine landscapes that are closer to a major metropolitan area than perhaps anywhere in the world. That regional juxtaposition also plays out on a smaller scale, because what makes the Wasatch attractive to a skier is not just the seven world-class resorts (or now because of mergers, maybe only five or six resorts), but more so the opportunities that exist outside them. That, in part, is what makes the Wasatch so amazing — unparalleled access to resort and backcountry opportunities alike. That stark contrast has not only captured the hearts and minds of locals, but has also become attractive to employers seeking to offer their workforce a healthy, adventure-laden, high-quality of life. One Wasatch does not enhance this lifestyle — it hampers it. The region we are talking about is only about 220 square-miles. Proponents of One Wasatch like to compare this concept with Europe, but the Wasatch is hardly Europe. The Alps are approximately 150 miles wide, the Wasatch is only a paltry 15 miles wide. In addition, the backcountry of the Wasatch is a busy place. It is home to the most rapidly growing sector of the ski industry — backcountry skiing and snowboarding. In addition, this backcountry mecca is also shared with a local heli-skiing operator that competes for the same precious powder. These are only two groups of winter recreation that will experience a reduction in available terrain because of the One Wasatch concept. There are many others. Our hope is to protect the Wasatch, the balance of opportunity, and the year-round environmental and recreational experiences that exist today. We have a unique balance delicately teetering on a knife’s edge arête. One Wasatch skews this balance toward development and destroys the opportunity for others who seek solace and adventure in this small but treasured alpine range.